Home » Made In Japan » Hey, It’s Sushi O’Clock! Best. Purchase. Ever. How many ways do I love Kappabashi, the street where Tokyo restaurants go to shop? If you’d like to visit Kappabashi Street the next time you’re in Tokyo – where you can make your own plastic food, buy half-price dinosaur heads and nyan-tastic cat teapots – directions & maps are on my website, The Tokyo Guide I Wish I’d Had. Very cool, but don’t you get confused? I mean, is it 10:00 or Akagai o’clock? If everybody had sushi clocks and sushi watches and sushi phones, it could always be akagai o’clock! Want. I would also love it if it were an actual serving of sushi with a minute hand (NOT a second hand, please) that gently nudged the next piece toward your chopsticks. 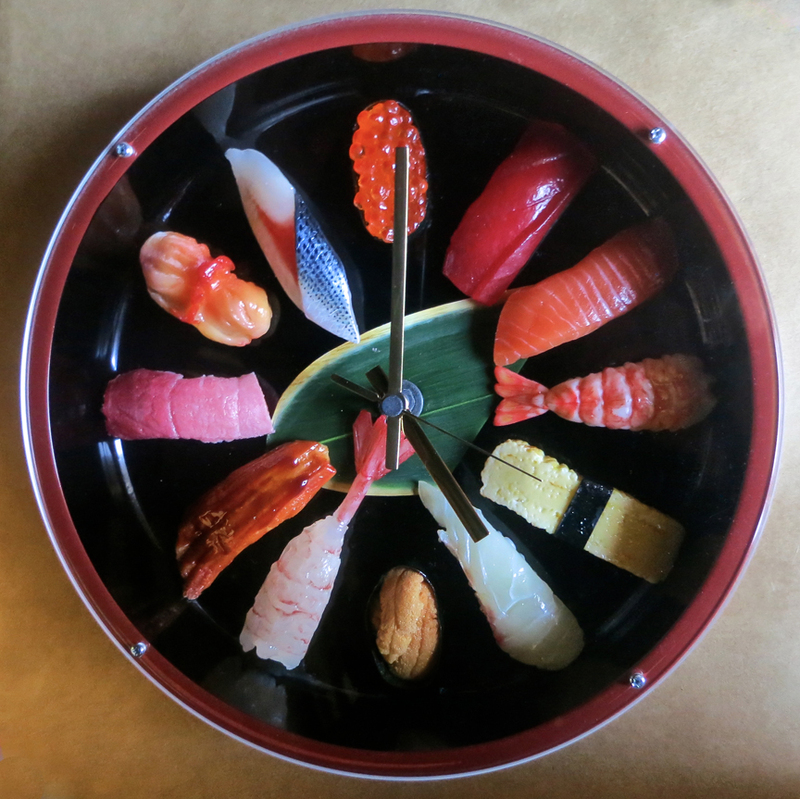 Every time I look at this clock, I wish I had a piece of sushi being gently noodged toward my waiting lips! I actually saw a clock that used chopsticks as the clock hands, but it was from a store with lesser-quality plastic food, so I went for the mouth-watering fakes instead. Sometimes I wish it looked less real! Funny, I have always wondered who buys these! (^-^;) But that reminds me… it’s time for…! Wait til you see my little minka farmhouse lamp! I’ll be revealed as the tourist-ware sucker that I am. How much do these clocks cost in Japan? Well, they’re sort of shockingly Not Cheap. This one (if I remember right) was upwards of $120US. Which isn’t surprising when you know that each sushi piece is handmade and the indivudual magnet versions costs $12-$15US each.